All of the projects we work on are designed to be robust, long-lasting solutions that will stand the test of time. We design, create and finish all items at our facility here in Andover, Hampshire, for unparalleled attention to detail and quality control, combined with a healthy dose of ‘real world’ practicality and ‘build to last’ design. We can also create bespoke metal work and lighting to your specifications. 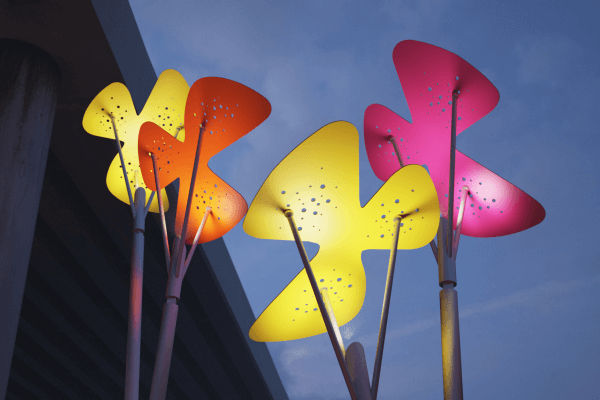 Bring us your designs for innovative lighting installations and lighting-related street furniture, and we can help make it a reality. Set in the heart of Glasgow, these stunning sculptures were awarded winner of Future Building, Scottish Design Awards. Vivid colours and use of LED have transformed the area, creating a distinctive look that is built to last.